Personally I would have loved to see her Xiao Long Nu wax figure more than anything else just like the character waxes of Nicky Wu as Emperor Kangxi and Sun Li as the legendary Zhen Huan. Instead it’s a modern version in an embellished pink gown. She joins other Asian stars including Jackie Chan, Donnie Yen, Sandra Ng and Kim Hyun Joong at Madame Tussauds, Wuhan. Playful as she is, Liu Yi Fei kissed her wax self saying that she’s happy to have finally met her twin sister. She also coyly posed with superstars Michael Jackson and Johnny Depp and excitedly took a picture with Einstein. Jin Se Yeon has been cast as Yoon Ok Ryeon in the upcoming KBS2 drama Age of Feeling감격시대, a role originally offered to Kim So Eun who backed out at the last minute due to scheduling conflicts. The drama was intented for a November release but because of its story which necessitates filming overseas extensively, it was pushed to a January play date after Bel Ami. Since the drama is about the struggle of a group of young people during the 1930’s just before the war, the production team had to film key scenes in Shanghai. The last time I saw Jin Se Yeon was in the Joo Ji Hoon comeback project Five Fingers. She also took over the role originally intended for T-Ara’s Ham Eun Jung. Back then, Ham Eun Jung was forcibly removed because of the whole bullying incident which was blown out of epic proportion. After a gazillion of he says, she says and an apology later, everything is back to normal for the group. She joins Kim Hyun Joong (Shin Jung Tae), the male lead and female lead Lim Soo Young (Ga-ya). It has been reported that KHJ has already started filming. With the released BTS, looks to me like he really wants to work the whole machismo thing and I say it’s working. He sure exudes tough-rough male to me. What would Yun Ji Hoo (Boys Over Flowers) say to all this? After the failed City Conquest, this has got to be a welcome respite for him. Reply 1994, To Get an Extension? The cable TV drama Reply 1994 응답하라 1994 (tvN), was originally set to have a 20 episode run on 1 episode per week but started airing back-to-back, (Friday-Saturday) episodes from the second week. The drama has aired 11 of its intended 20 episodes in the last six weeks. Initially, if completed as planned, a total of 20 episodes with 9 more remaining until the finale in the last week of December will be broadcast. But the production company and network is now faced with a tough decision. To extend or not, that is the question. It is doing even better that it’s predecessor, Reply 1997. The rating is continuously rising. With cable TV standard, this is beyond remarkable. According to Nielsen Korea the ratings are as follows; Episode 1 2.6%, Episode 2-3 3%, 3.2%, Episode 4-5 4.2%, 4.7%,Episode 6-7 5.8%, 6.2%,Episode 8-9 7.1%, 8.1%,Episode 10-11 8.8% 8.8% (up 10.6%). Calling it a phenomenal hit would be a just summation. PD Shin Won Ho however denied this rumor saying that there is no extension when asked by the media. He said, that a lot of things should be considered especially the story. It’s good to know that doesn’t want to sacrifice the quality of the drama for the sake of ratings. Although I am not utterly loyal to this drama, I think that it’s throwback feel is what is drawing people to it. Nostalgia plus the hilarious cast of mismatch couples are just some of the perfect elements this drama offer. So if you aren’t watching this yet, I suggest you do, like right now! From the makers of the beautifully executed period series Prince of Lan Ling come another period drama starring Tang Yan, Hawick Lau, Tony Yang and Lemon Zhang called Lady and the Liar千金女贼. What is more interesting about this production is that it brings back the art director responsible for the artistic scenery in Prince of Lan Ling, Gossip Girl artistic director Charles E. MacCarry and the South Korean team responsible for the awesome special effects in Painted Skin 2. If the producers are willing to spend as much and make sure that the technical aspects are well made, this could be another sure fire hit in the making. The story took place in the 1930’s during the Shanghai Concession, at a time when chaos gripped the land. 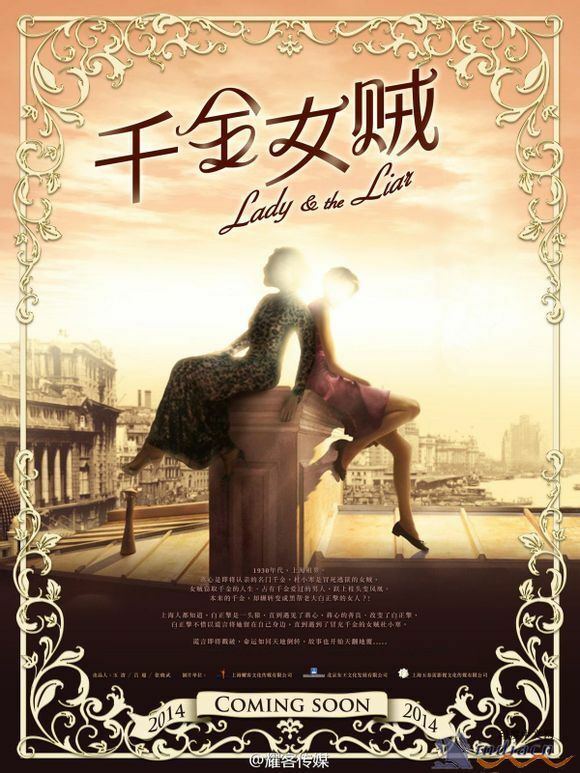 It tells the story of Jiang Xin (Tang Yan),the daughter of the richest man in Shanghai but lost all her memories due to a shipwreck. Her life was stolen by Du Xiao han (Yang Rong) posing as Jiang Xin. Their fates are interchanged. Two men helped her regain her memories but who would she trust, the man who lied to her, Bai Zheng Qing (Hawick Lau) or the man who constantly stood by her side, Wen Sheng jie (Tony Yang). The boot camp will start in December and is slated for release next year. It is a 45 episode period-romance directed by Zhou Xiao-peng. 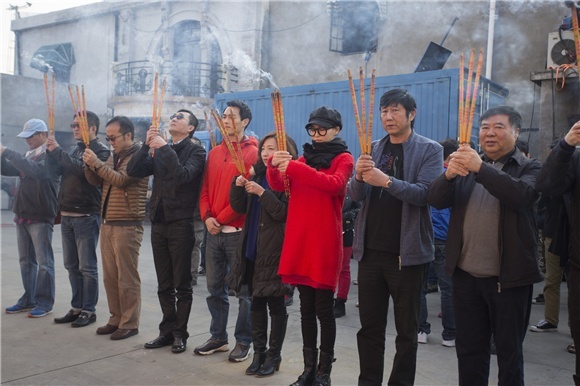 The team gathered for the ceremonial peace offering and prayer lead by Tang Yan and Tony minus Hawick, who was absent due to prior filming commitments. I actually wonder how they manage their schedules. All 3 of them are currently doing other projects. It will also be Hawick and Tang tang’s second time working together but I’m pretty sure that no “love angle” is necessary since everyone knows that Hawick is engaged to Tang Tang’s real life BFF Yang Mi. 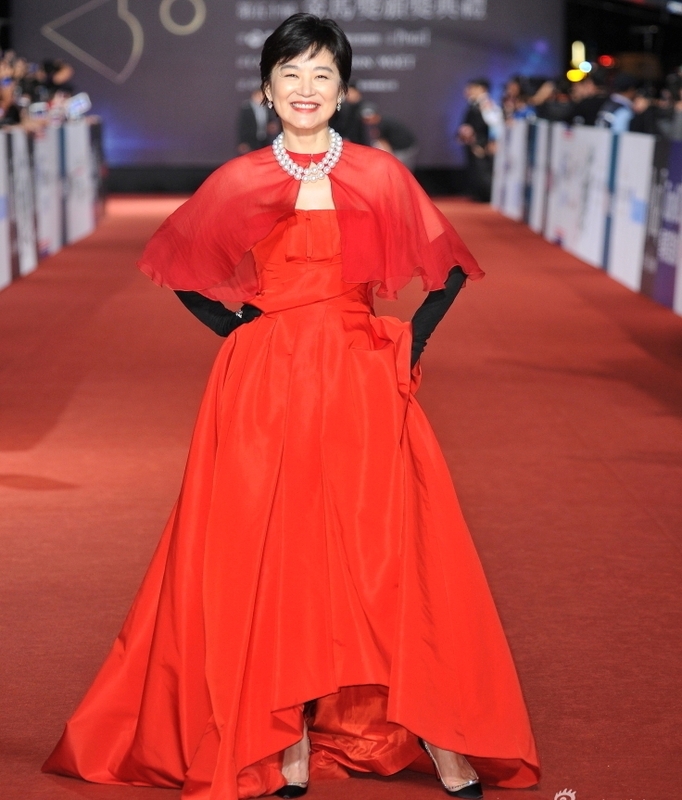 50th Golden Horse Awards Red Carpet and Winners! Stars from China, Singapore, Hongkong, Malaysia and Taiwan gathered at the Sun Yat-sen Memorial Hall for the prestigious 50th Golden Horse Awards this weekend. It was a who’s who of the greater China region as A-listers attend the Chinese version of the Oscars. The event is even more sentimental because it brought together previous winners over the years who normally don’t come together in one occasion. It was specially nice to see Brigitte Lin and Maggie Cheung, two of the best actresses,in one event again. Singaporean film Ilo.Ilo won top honors as it bagged the Best Feature Film while The Grandmaster took home several major awards. Fashion-wise, I like Maggie’s royal blue Elie Saab lace gown and Sonia Sui’s daring, elegant black gown. Shu Qi’s Valentino dress is sort of out of place and her hair is just plain wrong. The french braid can be both casual and dramatic if done the right way but hers was just messy. Yao yao’s mini dress is age appropriate but she should have gone for pumps instead of those hideous platforms. The men were almost identical in their black suits.